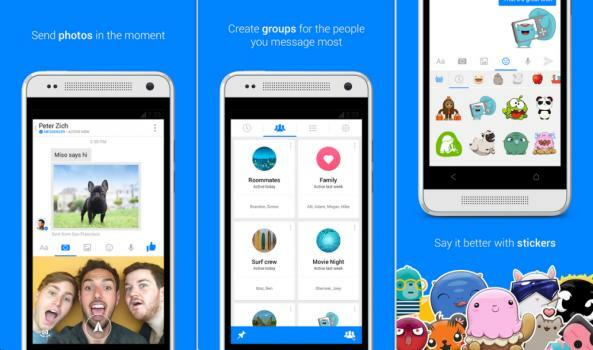 Facebook has updated its messenger app to version 5.0, bringing faster video sharing, photo, sticker access and more. The new 5.0 update brings feature improvements to both Android and the iPhone. With a new streamlined design meant for sharing and accessing pictures and videos along, and a new shortcut for downloading sticker packs, the app has made things much easier. Users can download the Facebook Messenger 5.0 for iPhone and iPod from the Apple app store and from the Google PlayStore for Android devices. The new update allows the users to share and access video clips with their friends however for this they need to have Android 4.3 or the higher version. Earlier it was limited to only pictures and voice recordings. There is one more ‘selfie’ mode which is built in. Not just that, now users will also be able to search people and groups by name. The app will allow users to download a sticker pack by pressing and holding any sticker that someone sends you.